Finally... an economical draft inducer for solid fuels. AD-1 Auto-Draft Draft Inducer for your wood, coal, corn burning stove and furnaces. 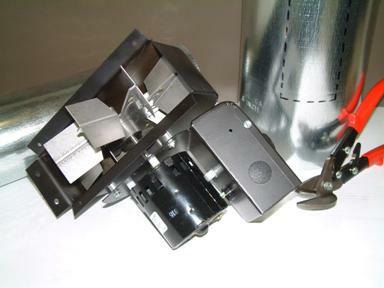 Draft inducers are electrically operated devices which increase the air flow up a chimney. This action increases the negative pressure (draft) in the stove, preventing smoke from leaking out of pipe, seams or doors. The AD-1 draft inducer causes no additional pipe restriction and can be "used as needed". No more smoke....Turn it on to load wood or during a draft issue, and shut if off. Unlike top mounted units and chimney fans which must remain on during any burn... the AD-1, even with a power outage, allows use of your heating stove. Overcomes flow reversal in non-self-starting chimneys. Encourages complete utilization of fuel, leaving a fine ash. Specially designed heat resistant, radial type blower. Fits 5, 6, 7 and 8" diameter stovepipe. Operates on standard 110 VAC. 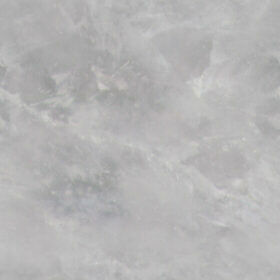 Dimensions: 11 5/8" x 8 1/2" x 7 1/2". Great DIY project. Easily installs by cutting a rectangular 8 5/8” x 3 1/8” hole in the single wall flue pipe from the stove. Vertical mounting, you need at least 12 to 24” clearance above the stove. A closer mounting may be possible with some form of heat shield to deflect rising heat from “cooking” the fan controls. The AD-1 has a heat-treated housing that allows it to withstand pipe temperatures up to 700 degrees and even though the unit gets HOT from the high pipe temps the ambient room air around the controls should not exceed 104 degrees. On a horizontal pipe installation the fan must be in attached to the underside of the pipe and concern be placed on its distance from a combustible wall surface. This installation may also keep the unit cooler as it will be further from the heat source. The fan is only pre wired to the speed control…. There is no “plug-in” cord off the control box, but the unit only draws .8 amps, so a wired plug can be attached to use a close wall outlet. A conduit pipe should be part of the electrical installation, mostly to protect the cord from melting or accidentally draping on the hot flue pipes. After installation, a turn on the variable speed switch allows smoke free loading and tending of your wood stove. 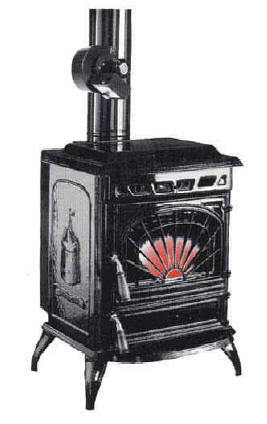 With Auto-Draft draft inducers your hard starting stove draws immediately. No smoky back up even with moist hard to ignite types of wood. Once the fire is burning, adjust the variable speed control knob on electrical box for maximum efficiency of your stove. Auto-Draft draft inducers provides for total utilization of your wood, leaving only a fine ash residue in most cases. 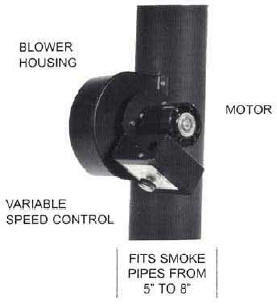 Auto-Draft draft inducers can be installed on any wood or coal burning stove pipe from 5" to 8" in diameter. Designed to solve draft problems without increasing height or diameter of the chimney.